As much as I love all things food, I rarely venture into salad making territory. Since my fiancé and I have both been working really hard at getting back in shape after a crazy couple of years with our kids, salads are back on regular rotation. Healthy living is something that has always been important to both of us, yet is incredibly easy to get off-track with. Healthy recipes that are easy to make and full of flavor helps when it comes to staying on track. I love flavor, sauces and dressings, and cheese. My fiance loves kale and chicken. Put that all together and what do you get? A insanely delicious Southwestern Chopped Chicken Salad. After eating huge bowl after huge bowl of this salad, I am convinced that anyone who tries it will love it. Let’s get into the ingredients, shall well? The base of this salad is chopped kale. If you are absolutely, 110% convinced you don’t like kale, you can use chopped Romaine lettuce instead. My 9-year-old hates kale and was in complete shock that he ate it (and liked it) so you might want to give it a chance here too! There is also chili spiced chicken diced small, red peppers, corn, and black beans. My favorite ingredient in this salad is the cheese! I use a Jalapeno Jack Heluva Good!® Block Cheese that I buy from Walmart. It’s easy to chop into small cubes and has the perfect flavor to mesh with the overall Southwestern vibe of this salad! The icing on the cake (or rather, the dressing on the salad) is a Cilantro Lime Avocado Puree that is so good! I’m not even a fan of avocado, but love, love, love this! I can eat it straight off the spoon. And I do! This salad might look like it takes a while to make, but it’s actually incredibly simple! It’s not called a chopped salad for nothing. Make sure you have your cutting board and a good knife handy. You will also need a medium skillet, a small bowl, and all of your ingredients. Dice the chicken into small cubes, chop the kale into small pieces, and cut the Heluva Good! Jalapeno Jack cheese into small cubes. Add 1 t of olive oil to a medium skillet over medium heat. Season the chicken with salt, pepper, and 1/2 t of the chili powder. Cook for about 5 minutes, or until cooked through. Set aside to cool. In a small bowl, combine the corn, black beans, red pepper, and remaining 1/2 t of chili powder. Stir to combine. To make the avocado puree, add the avocado, lime juice, cilantro, olive oil, and agave to a blender cup. Season with salt and pepper. Blend until well combined and smooth. 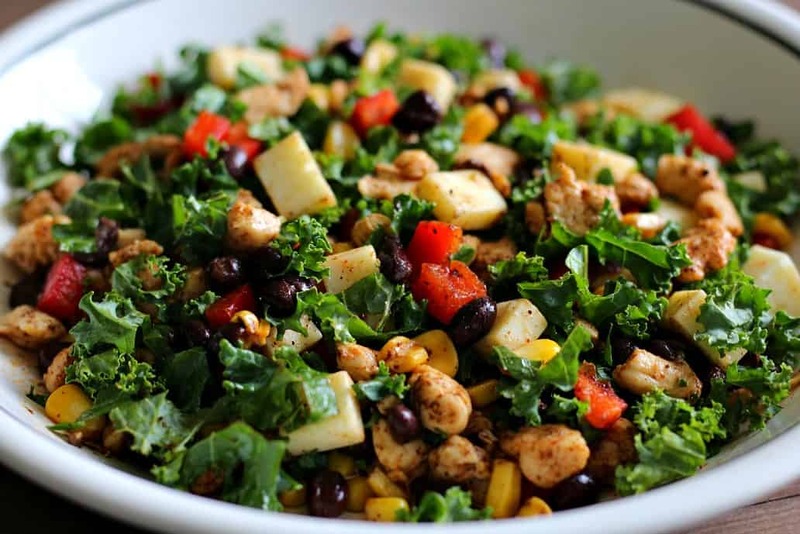 Divide the kale, corn mixture, cheese, and chicken between 2 bowls. Top with 1-2 spoonfuls of the avocado puree, toss, and enjoy! Heluva Good! cheese is make with milk and is gluten free. 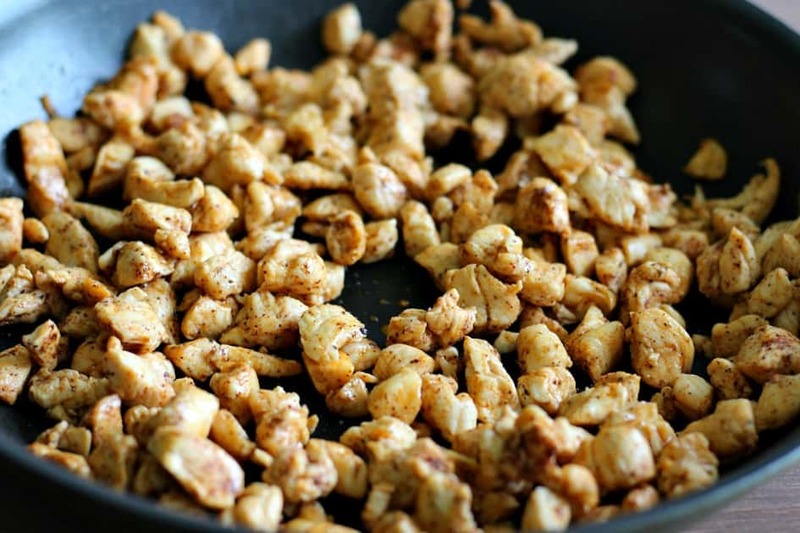 There is no trans fat and it’s a good source of protein as well as an excellent source of calcium. It comes in large variety of flavors that are perfect for so many different recipes and occasions. You can find Heluva Good! cheese in the dairy aisle of grocery stores in parts NY, PA, CT, MA, OH, RI, FL, VA, MD, DE, and Washington D.C.
Be sure to grab a block of the Jalapeno Jack so you can make (and fall in love with) this Southwestern Chopped Chicken Salad ASAP! 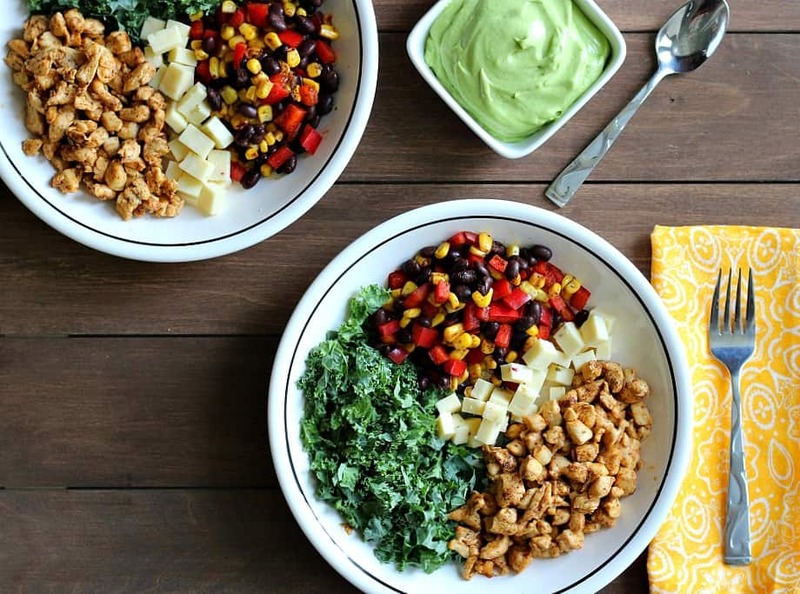 This Southwestern Chicken Salad is full of healthy ingredients! 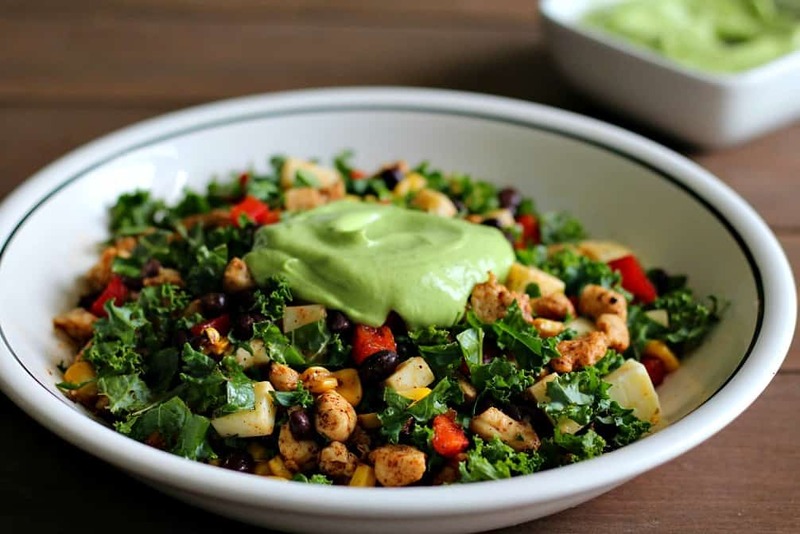 Kale, vegetables, cheese, and chicken are chopped and combined, then topped with an incredibly delicious Cilantro Lime Avocado Puree! Season the chicken with salt, pepper, and 1/2 teaspoon of the chili powder. In a small bowl, combine the corn, black beans, red pepper, and remaining 1/2 teaspoon of the chili powder. Stir to combine. 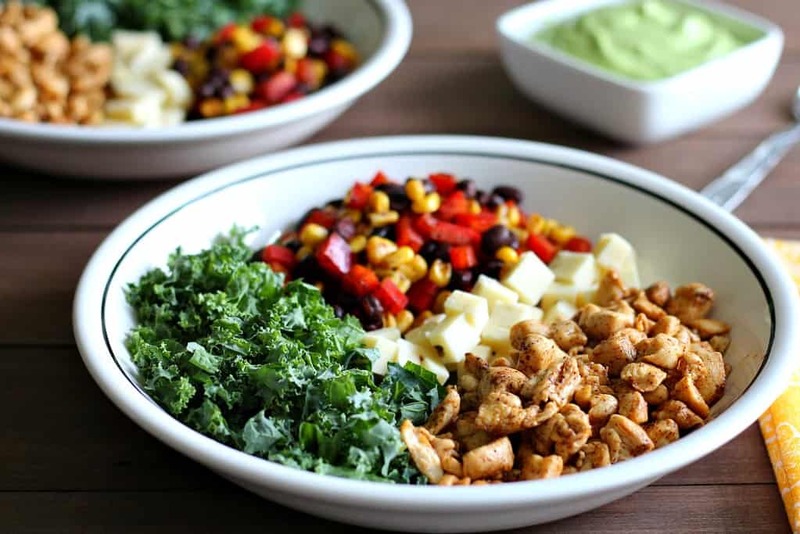 Divide the kale, corn mixture, cheese, and chicken between 2 bowls. Top with 1-2 spoonfuls of the Cilantro Lime Avocado Dressing, toss, and enjoy! If you absolutely do not like kale, you can substitute Romaine lettuce instead. Store any leftover salad and dressing separately, tightly covered in the refrigerator. Is Southwestern Chicken Salad gluten free? Yes, this recipe is 100% gluten free without any needed modifications. 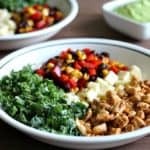 Is Southwestern Chicken Salad healthy? With the definition of “healthy” meaning different things to different people, I can say that this salad is loaded with good-for-you vegetables and healthy fats like avocado and extra virgin olive oil.